Last Saturday, at the quiet hour of 5:30, I went to Cafe Maude in South Minneapolis with Lisa. Lisa is like a quirky aunt you love to have in town because she keeps you apprised of the city’s cultural events that other people might take for granted. This time, she asked me to join her in volunteering to usher at The Jungle for Hedwig and the Angry Inch. After our meal, we darted to the theater to hand programs and ear plugs to a full house both happy and gay. In return, we enjoyed the show for free. And what a show it was! I’m a self-proclaimed detail junkie when it comes to food. I might feast on a shoe if it was listed on the menu alongside irresistible and slightly exotic sides. At Cafe Maude, the attention to detail is obvious in everything they do: the colorful decor, the wide variety of thoughtful food, the stellar drink and cocktail list, the musical acts, and the absolutely creative way in which it all is presented. These people think outside the box, and I love them for it. I wondered if Maude Armatage, who the restaurant was named after, was as flirtatious as this. The Rubber Ducky lemonade? Served with a candy Peep on top. A cocktail called This Charming Man? Served with an English cigarette. The check? Delivered in a vintage hardcover library book tucked into a relic of changing times: the due date pocket. Did I say love? Yes. I did. The service was friendly and authentic. The food was beautifully presented and consistent. We didn’t experience any Rachel Ray-style meltdowns upon tasting any of our items. But Lisa and I both agreed. We recommend it for dates and any casual night out where you might be inclined to linger over a glass of wine and the company you are with. But if you really want to knock a foodie’s socks off, you might consider going elsewhere. 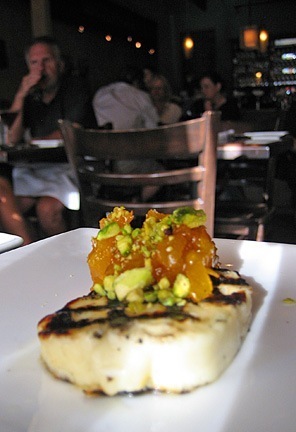 Grilled halloumi, a Greek goat and sheep’s milk cheese with apricot pistachio marmalade. Halloumi is one of my favorite cheeses, and since it is so unrepresented at restaurants, we had to try it. Not great. It was overgrilled, and the cold cheese tasted like it was taken off the grill an hour ago. If it had been slightly warm and did not taste like the skin of a charred Minnesota bratwurst in July, the flavors would have been delightful. 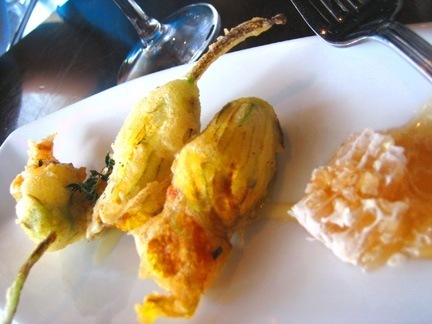 Lightly fried tempura squash blossoms filled with goat cheese and served with a side of citrus honey. One of the specials, and delicious. Just don’t overdo the citrus honey dip, and you’ll be happy with this curious mix of texture and flavor. Knife and fork Caesar. 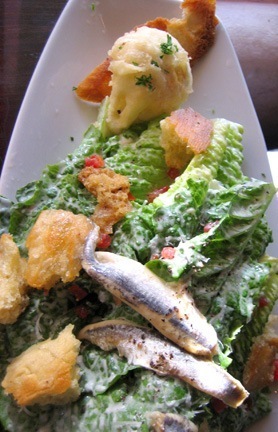 Baby romaine, Parmesan, lemon, white anchovy, tempura fried egg, and garlic croutons. A deconstruct-it-yourself Caesar salad! I adore a tangy, sharp Caesar, and this did not disappoint. Once I brought everything together, I enjoyed fresh white anchovy with every bite. This is the Caesar for me. It even came with a warning from the server. May Cafe Maude put wimpy Caesars out of business for good. 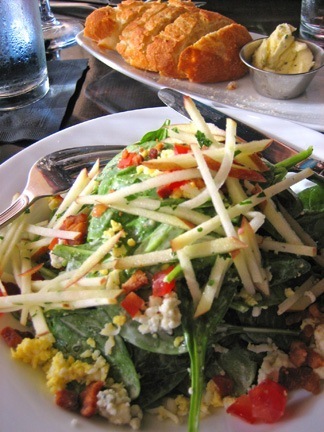 Baby spinach salad with blue cheese, bacon, grilled onions, apple, and a soft-boiled egg. Pretty. With the promise of the soft-boiled egg, we hoped it would be hiding underneath this lovely nest of a salad, waiting to be pierced. Alas. It was tossed throughout in small pieces. Still. The sweet and savory combination put a smile on our faces. 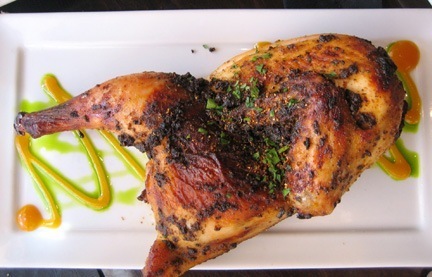 Roasted half chicken with apricot and Moroccan spices. No arguing this one. Plain-old yum, although we would have preferred a more distinctly Moroccan kick. There seems to be no way you could go wrong with Cafe Maude. You leave having experienced a convivial meal in an exceptionally creative setting. Now I just have to go back when the music is in full swing, an entirely new element sure to turn me from a Cafe Maude coquette to a civilized habitué. 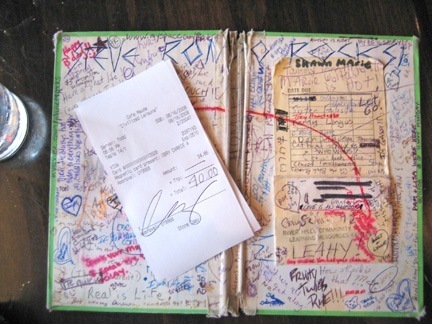 This entry was posted in Gal pals, Minneapolis Restaurant Reviews on August 29, 2008 by Carrie. In which I, for the first time, try my hand at writing a restaurant review. What do you think? The April issue of Metropolitan magazine included quite a juicy article about the relationship between dining experiences and graphic design. The author, Steven Heller, argued that the elements that make up a great meal are only isolated statements if not somehow brought together with an evocative visual element. Like a book with an irresistible dust jacket, graphic design allows a restaurant to tell its story by artistically setting the tone for a meal. Despite this chic presentation of proletariat joy, there wasn’t all that much fun, kitschy, or communal about our experience. The setting, a low-slung neighborhood shack, is quiet, with elegant white walls, large windows, and clean lines. When my friend and I stepped in and asked if we could get a table for two, the hostess seemed so caught off guard that I had to remind her that it wasn’t a trick question. At the table, we relaxed into the quiet hush of a new restaurant and ordered two appetizers. One was pickled vegetables, which tried to be a satisfying counterpoint to the meal I had come to expect. The other was braised beef short ribs. I don’t know much about the vocabulary of meat, but we had to poke around to identify what we should be eating. The service, while pleasant, was a little lacking. We didn’t have water, bread, or a knife for our appetizer until well after these items should have arrived. And while we appreciated the accompanying butter and homemade beet spread, the two types of bread at the table were absolutely lifeless. In a city where every guy and gal on the payroll can pick up an acceptable loaf of freshly baked bread at Rainbow, why should we settle for less? For my entree, I was pleased with a unique twist: a Caesar salad with scallops. A bit of a Caesar addict, I tend to rely on its distinctive taste as an indication of a restaurant’s ability to express itself. The scallops spoke to me like a perfectly fluffed bed of pillows. I dove in and enjoyed the soft taste of lemon complemented by the perfectly browned tops, but the rest of the salad didn’t say Caesar to me much at all. My friend also ordered a scallop salad, but with roasted tomatoes, bacon, and homemade creamy dill dressing. We both raved about the scallops and suspected that the restaurant was trying to woo us with their generosity. We each had five or six of the big guys. What did we think while relaxing by the large windows and enjoying the late-afternoon sun? The food at Citizen Cafe isn’t as hard-working as their logo suggests it will be. After a long day at the office, we workaday girls felt a little toyed with rather than satisfied. However, in a somewhat unstylish neighborhood lacking a lot of contemporary restaurant options, Citizen Cafe will find its appeal. The prices are good, the setting is clean and comfortable, and the upcoming liquor license will make for a happy neighborhood clientele.